1) Why did you decide to give the Bears your name? That wasn’t our decision. The first book we did was called The Big Honey Hunt. We didn’t call them the Berenstain Bears. Our editor was Dr. Seuss. When we did the second book, it was called The Bike Lesson, and Dr. Seuss put on the cover The Second Adventure of the Berenstain Bears. So it was Dr. Seuss who named them, not us. 2) Is Bear Country based on a real town? Well, in a funny way it is and it isn’t. We started doing the Bear books and created the look of Bear Country before we moved to our present home. The funny thing is where we live now looks exactly like Bear Country. 3) What made you decide to use a tree house for the Bear’s home? I wish I had an answer for that! It just seemed as inevitable as the sun coming up in the morning. When we decided to do a children’s book, it never occurred to us to have them live anywhere except a tree house. We get a lot of mail that says something like “I wish I could go to Bear Country and live in a tree house with the bears.” I guess it’s every child’s fantasy. 4) How old are the Berenstain Bears? Mama is 27 and Papa is 29. Sister Bear is in first grade, Brother Bear is in third, and our new little Honey is about 18 months old. They won’t ever get older! 5) Why won’t the Bears grow older? Stan: Because the books are written for children who are about the same age as Sister and Brother Bear. And we think they’ll be more interesting and more fun for our audience. 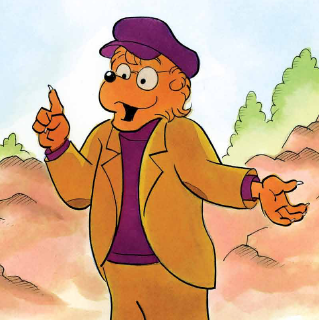 We also do Berenstain Bears Chapter Books, and there are older cubs in those books. 6) Why are the pictures in The Big Honey Hunt different from the other books? Stan: That is a very good question. The answer is that we really didn’t know how to draw the Bears in the beginning. In addition to that, our editor was Dr. Seuss, and he wanted the Bears to be as funny and comical-looking as possible. 7) Why do you start all of your books with a rhyme on the first page? Jan: Well, the first book we did with a rhyme in it was The Berenstain Bears’ New Baby, and I thought it would introduce the story nicely and set the scene. Stan: It seemed like a good idea at the time, and it still does. 8) Out of all the characters in all your books, is there one who has become your favorite? I guess my favorite is Papa Bear because to a great extent he’s based on me. He tends to get carried away, as I do. He tends to be a little bit clumsy, as I am. And he has very good intentions, as I do. Now I’m only occasionally as foolish and accident prone as Papa Bear is capable of being, but I do have my moments. I bet you Jan would say Mama Bear, because Mama Bear is based on Jan. Mama Bear is warm and wise and almost perfect, like Jan. I think they are like terrible exaggerations of the two of us. This is so sweet. That last part broke my heart into a million pieces! “Mama Bear is warm and wise and almost perfect, like Jan.” They seem like they had a great love and adoration for each other. 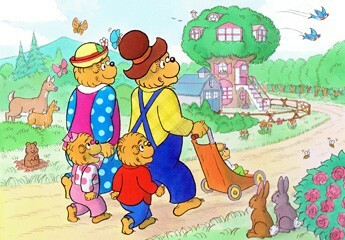 God Bless the Berenstain family & the beautiful legacy they left behind for us to enjoy. Thank you for your very nice comments. Jan was, indeed, a truly special lady and they did have an amazing marriage. We miss them both so much! LOL! Thank you for your very kind comments! Please give your cubs an extra-special *bear hug* from all of us! I loved reading that interview. I loved the books as a child and I love reading them to my kids! We always laugh when they quote “first come the lessons, then the fun” I always buy The Bike Lesson and The Bears Picnic (our favourites) for baby presents. Thank you Bears for bringing extra joy and fun in our lives. Thank you for your very kind comments! And, we’re glad you enjoyed the interview with Stan and Jan.